You could be a proud owner of a street rod, classic car or a muscle car, but there are chances that you have to deal with a huge amount of noise whenever you are driving it. If you own a premium set of audio speakers, you will have an idea about sound deadening. Sound deadening elements help in eliminating any unwanted noise from your vehicle and prevent it from interrupting the music that you are playing in your car. 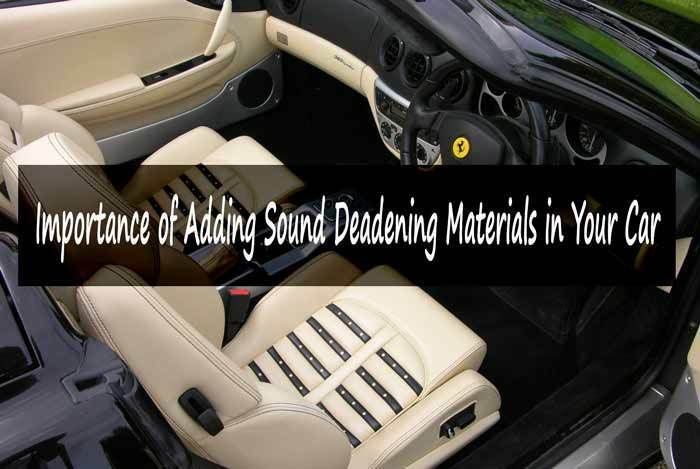 Sound deadening materials help in getting rid of the engine clutter and vibration of your vehicle, and they help in converting vibration into heat, thereby reducing noise. This is an informative article about the importance of sound deadening materials and the kinds of materials that should be used. The automobile manufacturers usually apply sheets of butyl or asphalt materials to the firewall as well as floors, and door panels of your vehicle. The sound dampening material helps in adding a mass to your panels, thereby making it difficult for vibration and sound to move through the panel and reach the interior of your car. Most car manufacturers do not emphasize on the audio systems of your car. When you apply proper sound deadening materials, it can have dramatic effects on how your audio system performs. But the next day when you turn on the stereo system again, you realize the music system starts working normally. This is because your car engine and the road where you were driving the previous day played a crucial role in compromising the quality of music. The noise that interferes with your audio system normally comes from your tires, exhaust, engine, wind, and the nasty vibrations and rattles of the road. These sounds compete with your audio system and clearly win. When you add sound deadening materials in your car, it helps in keeping it quiet and peaceful. A car with no or less noise levels make it easier for you to drive peacefully, keeps you away from headache, and ensures that you enjoy your road trip to the full. Driving becomes a lot more comfortable as you do not hear the noise from your tires, engines, or road. Additionally, it helps you to listen to music comfortably. There is no need to turn up the volume in order to drown the sound of the surroundings. In a similar manner, when the noise in the surrounding is canceled, your speakers do not have to work hard. Most of the time, people tend to think that automotive noises are nothing big and they ignore them. However, it becomes irritating when you are driving daily. There are different types of sound deadening materials that help in cutting off the excess noise. Dynamat: Dynamat is a great sound deadening material available in the market. It helps in isolating your car’s cabin from all the unwanted sounds. It is costlier in comparison to other materials that are present in the market. Nevertheless, it plays an important role in creating an acoustic environment for the stereo system of your car. If you do not have any budget constraint, you should use Dynamat for your entire cabin. However, if you have a tight budget, you can use Dynamat for the doors and areas where your speakers have been mounted. Dynamat has separate kits for doors, trunk, hood, floor, and your car headline. It depends on you as to how much Dynamat you require for your car. B-quiet: Another efficient sound deadening material is B-quiet. It is a viscoelastic deadener, which has a butyl-based adhesive along with a constraining aluminum layer. This sound deadener has proven to be efficient in converting the vibration of your car engine to thermal energy. B-quiet is almost 1.6mm in thickness, has a weight of 0.35lb/sq.ft and is available in two sizes of twelve and fifty sq.ft. rolls respectively. Fatmat: Fatmat is not just effective, but it is also affordable. If you have a low budget but you are looking for an effective sound deadener, you should not look beyond Fatmat. It will help you to cut down the extreme noise that you have been waiting to get rid of since ages. You should keep in mind that this material cannot tolerate heat and if you live in an extremely hot climate, you should not use this. It will be wiser to invest in materials that will last for a long time. Hushmat: Hushmat is a recognized sound deadener which is self-adhesive and sticks on any surface. It can not only reduce sound by fifteen decibels, but it can also reduce seventy percent of the heat entering your car. Noico: Noico has been used effectively for soundproofing a number of areas, but it is used mostly for blocking the automotive noise. They are thick mats and they contain butyl, and they help in reducing the sounds of your engine, tires or any other noise of the road. You can use Noico to soundproof any part of your car. Many other products are available, which have foam on top of an aluminum sheet. Foam plays a great role in eliminating the rattles and buzzes. When selecting the materials, you have to keep in mind that not all the sound deadening materials can withstand similar temperatures. Many people also make use of deadeners that are not designed for automotive. This may cause the materials to melt and the cost of repairing this damage can be high. It is important to install sound deadening materials, but it should not be done without consulting an expert. It is necessary to drop by your retailer and ask them about sound deadening. Using sound deadening materials will help you to remain comfortable when you are driving and it will definitely be worth all your investment.